If you're away from home for long periods of time, an automatic cat feeder could be just what you need. To avoid disappointment, we recommend the PetSafe Healthy Pet Automatic, let us tell you why. Buying the best automatic feeder for your cat is a great way to ensure consistent meal times even if you can’t be around to provide it. Many of the best automatic feeders for cats feature programmable timers and are capable of holding six or more meals at once! After taking a look at the options out there, we’ve decided that PetSafe Healthy Pet Automatic is the best automatic feeder for cats. We’ll talk a bit more in-depth about that in just a second. We’re going to take a quick look at why we think each deserves a place on our list in a short while. We’ve judged them based on a few factors, but the primary influences are ease of use, reliability and value for money. First up, here’s a quick table containing what we believe to be the best choices for truly automatic feeding. 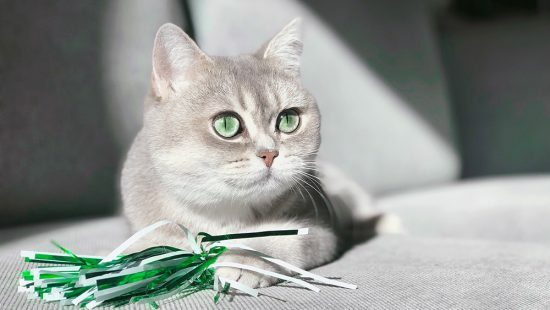 8 Are Automatic Cat Feeders Worth Buying? 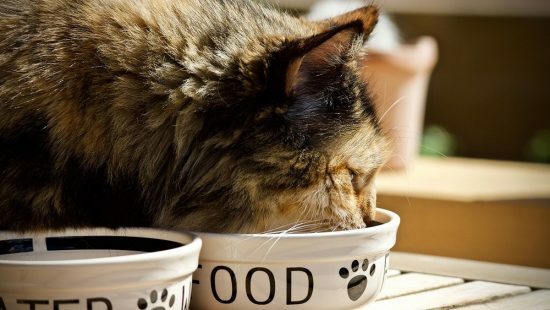 Automatic cat food dispensers will offer your cat an opportunity to eat at set times, something that is especially useful in helping them maintain a healthy weight. All you need to do is designate some times and fill the dispenser with your favorite dry cat food, it’ll take care of the rest! A few years back, even the best automatic cat feeding systems would consist of a single flap that unlocked to reveal a dish of food after a certain amount of time. These days, they’ve improved so much that they can keep your cat fed for days at a time without you having to be around. Let’s look in depth at some of the options currently on the market and review the pros and cons of each. Below is a list of the best automatic feeders for cats that will ensure your cat is fed the right portions at the right time. Featuring an “anti-jam” conveyor system, it dispenses dry and semi moist foods correctly every single time without issue. You can adjust the meal portions to be anywhere between 1/8th of a cup to a huge 4 cups. If you’re guilty of overfeeding your cat then you can sleep easily knowing the portion sizes are pre-set and reliable. The large hopper holds up to 24 cups of food and the bowl provided hods as many as 5 cups. The “pet-proof” dispenser means that your can’t cant stick their paws up into the dispenser to sneak some extra food out behind your back. It comes with an amazing feature called slow feed mode. You can dispense large meals slowly over a period of 15 minutes to prevent gulping and vomiting. This, along with the large capacity, is what really sets this automatic cat feeder apart from the competition. It comes with a handy instruction manual that explains all of the features and their usage. You also get a quick-start guide so you can get things set up in a flash. You have options to skip ahead to the next meal-time ahead of schedule, or to pause the whole system without losing the programmed schedule. This comes in handy if you happen to be on hand to provide some treats or want them to eat a different meal. 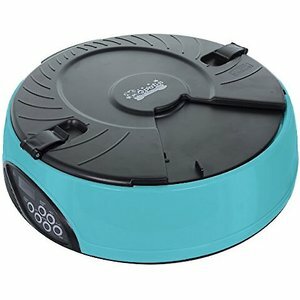 The whole unit is easy to disassemble and clean in less than 15 minutes. It’s removable steel bowl is more hygienic than your standard plastic bowl, a nice added bonus. It operates using 4x D batteries that aren’t included. 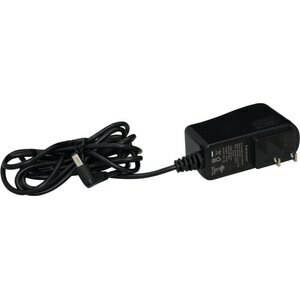 We’d recommend you opt for the optional power supply cable that is sold separately. It isn’t that expensive to buy at all and will save you money in the long run given how expensive batteries can be. You’ll also have the peace of mind of knowing that the batteries won’t die while you’re away and leave your cat without a few meals. It has pretty much everything covered. We can’t sing it’s praises highly enough so it’s no surprise that we’ve rated it as the best automatic food dispenser for cats. Check out what others think about it by clicking the button above. The Arf Pets automatic feeder for cats is a little different. While it only allows for timing up to 4 meals a day, the portion size can range anywhere from 1-10 portions per meal. Each portion is considered to be 24ml, so you get a vast range of flexibility when it comes to portion size. It’s best suited to single-cat households since you’re guaranteed to be satisfied with the 4 meals maximum per day. As with the previous feeder, it can be powered using batteries, 3x D batteries are sufficient in this case. It does however come with a DC power cable, so you don’t have to purchase batteries unless you need to place this away from a power point. It holds around 18 cups of food in it’s 1.1 gallon hopper, which is plenty for a few days of feeding with most cats. The lid has a magnetic lock which is pretty much impossible for cats to open (believe me ours has tried it’s best!!). The seal is air tight enough to contain the odor of food and keep it fresh for the duration of the feeding schedule. It features a few different voice commands which you can record yourself and dispensing alarms to let your cat know from afar that it’s meal time. 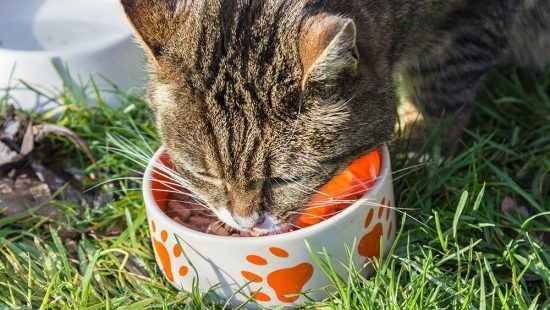 After a few uses though your cat will learn roughly when to expect food to be dispensed, perfect for setting a feeding routine! The slanted tray is perfect for making the food easily accessible, since a flat bowl would just cause the food to build up at the back close to the feeder making it hard for cats to reach. Programming this automatic feeder is pretty straightforward providing you read the instructions carefully, it can take a few tries to get right but you’ll figure it out. We love this feeder for it’s simplicity and reliability. It also provides excellent value for money, which is most likely the reason for it being the #1 best selling automatic cat feeder at the time of writing. To put it bluntly, it’s the best cheap automatic feeder for your cat, and with it’s excellent design it looks no less expensive than the top of the range models. Check out more using the link above. The PetSafe Smart WiFi/Smartphone is the upgraded version of the aforementioned PetSafe Healthy Pet Automatic that comes with WiFi capabilities built in. It features the same basic functionality we saw in the older model, including the excellent “slow feed” mode that prevents rushed eating. Much like the older model it also allows you to schedule up to 12 meals per day, with portion sizes between 1/8 to 4 cups. Aside from an updated design which we think looks great, the only real difference is the ability to remotely schedule your automatic feeder via a nice mobile app interface. The smartphone app is available on both Android and Apply iOS operating systems. The app itself is simple and intuitive, meaning that this is without a doubt the easiest automatic cat feeder to configure. It also allows you to check up on the status so you’ll know just how many meals your cat has had so far throughout the day. As you probably expect, the remote capabilities of this automatic food dispenser come at a premium cost. If you have the budget to be able to afford this model, we’d say you should go for it. We’ve always taken value for money into consideration when looking at the best products on the market, and it’s been no different while comparing the best electronic cat food dispensers. Unlike the older model, the power cable comes supplied with the feeder itself. This modern automatic food dispenser is fantastic, based on just features and design it’s easily the best automatic cat food dispenser available. But we got along just fine with the older, cheaper model. In our personal opinion the extra price bump isn’t justified unless you’re really keen on the remote capabilities or the sleeker design. See prices and a full feature list using the button above. 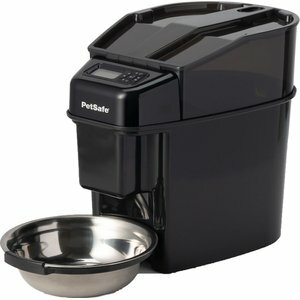 This digital pet feeder from PetSafe is a return to the more simplistic style of food dispenser. It features 5 chambers that hold a maximum of 1 cup of food each. If you’re keen on feeding your cat less then it’s fine to fill them as much as you see fit. The timer is super easy to set up and was extremely reliable during our testing. You can program up to 5 meals a day using a digital timer that goes up in hour increments. It’s entirely battery powered, though since it’s mostly inactive you can expect the 4x D batteries to last up to 12 months. So there’s not much to complain about there. This digital food dispenser is super easy to clean. The tray is BPA-free plastic and is entirely dishwasher-safe. You just detach it, pop it in the dishwasher and away we go. There’s no chance of your cat cheating and spinning this ahead of schedule. No matter how hard they try. It’s efficient, reliable and best of all it’s extraordinarily affordable. We view it as the best cheap cat feeder around, and since it’s relatively low-tech it’s difficult to see how anything could go wrong. If you’re on a tight budget, or have no need for the fancy features of the more premium cat food dispensers, then this is definitely the best the automatic feeder for you. Given that it only has 5 compartments though it’s best suited for single cat households. Qpets have manufactured an excellent automatic cat feeder in the AF 108 model that’s robust and feels quality all round. Capable of holding up to 6 meals at a time, it’s rotating style means that food is kept safely away from wandering paws for the whole day. It has an easy to read LCD screen that makes setting up scheduling a breeze. We’ve heard reports that it can lose time over long periods (6 months or more), so meal times drift out of sync. You can quickly set them back to be correct as there’s no permanent effect though. When setting the times up, it’s important you set them up from 1 to 6 in chronological order. If you fail to do so, it will skip entire days between the two times! The feeder operates off 4x C size batteries that last a good few months depending on the frequency of use. 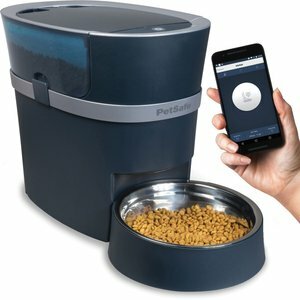 A nice feature of the Qpets automatic food dispenser is the ability to record custom voice messages. You can record up to 6 seconds of audio that will be played prior to meal time to alert your cat that food is now available. It’s a cheap automatic cat feeder that doesn’t quite reach the heights of the more expensive options. Despite that, it does a great job for those who want a cheap solution for automatic feeding. Check out more reviews on the button above. 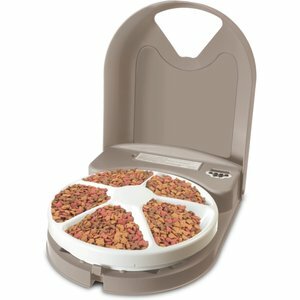 Are Automatic Cat Feeders Worth Buying? For 90% of cat owners, automatic cat feeding machines are a really worthwhile investment. 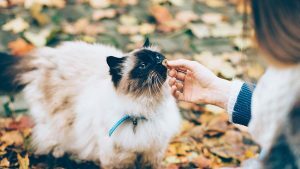 We’ve spoken about the epidemic of cat obesity before now and all about weight gain in cats, and one of the leading causes is the free-feeding habit so many cat owners have come to adopt. Free-feeding is the act of leaving a full bowl of food out constantly and letting your cat decide when to eat. In many cases cats will regulate their eating themselves, but that doesn’t mean it’s the most responsible choice. A majority of cats would benefit from a steady feeding routine, something that’s best implemented by using an electronic cat food dispenser. Our first concern is that of your cat’s health, but it also makes life a little easier for you. Most automatic cat feeders are capable of handling dry to semi-moist food and store up to 24 cups of the stuff at a time. For the full benefit of convenience, opt for a hopper dispenser rather than a rotating compartment style feeder. A feeder takes care of portion sizes and does all the hard work for you. All you need to do is set up an initial scheduling and make sure the hopper always has a meal to dish out. 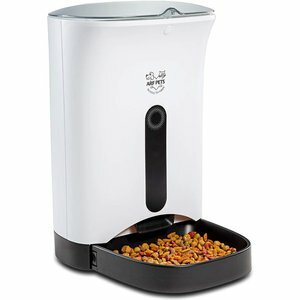 Automatic cat feeders come in a variety of different styles, each with their own unique features. Let’s take a look at some of the primary factors that should influence your decision on which cat food dispenser is best for you. Depending on how often and how much you feed your cat, you’ll need to choose an appropriate storage size. While old rotation style cat feeders use set compartments that usually hold a maximum of 1 cup of food each, hopper styles can hold up to 24 meals. For more precise portion control, use a hopper that regulates portions rather than a compartmental one. Because of this, owners with multiple cats definitely should be looking to purchase a large cat food dispenser with a sizable hopper and suitable distribution method. The last thing you want to happen is for your automatic feeder to jam while you’re away from home. A jammed feeder means no meals for your cat, and unless you have the WiFi enabled PetSmart feeder, there’s no way for you to know. This is particularly important if you plan to solely rely on the automatic feeder while away for days at a time. Jams happen when food gets stuck in the dispensing mechanism. Most of the time this can best be avoided by checking which foods are compatible with your automatic dispenser before filling it. Many of the top of the range automatic cat food dispensers come with anti-jamming mechanisms that work to free up the stuck food in the dispenser should it come to a halt. Most dispensers will offer the option to schedule the full contents of it’s storage across a 24 hour period, some even more so. In the case of the older style rotation food dispensers, there are only 5 or 6 compartments so you can program 5 or 6 feeding times respectively. With the larger hopper dispensers, you can change the portion sizes and schedule up to 12 meals a day. With the best automatic cat feeders, portion size can change depending on the scheduled meal. You can feed a little during the afternoon, and a larger meal in the evening. Just as with regular cat dishes, regular cleaning is vital in ensuring proper hygiene. Almost all of the best electronic food dispensers on our list are built with ease of cleaning in mind. Detachable dishes and trays make for easy dishwasher cleaning, taking the legwork out of maintenance. Check first whether or not your automatic cleaner is safe for dishwasher cleaning. It’s best to avoid placing the feeder in direct sunlight as the heat is likely to cause the food to turn stale and decompose faster. Hoppers can be removed and swilled with warm soap and water between fills to ensure they stay fresh and clean. Premium automatic cat feeders come with modes that allow you to provide a different feeding experience. Slow feed mode will dispense food over a set duration to avoid cats being able to gulp down their food. This is especially helpful if you have a cat who is prone to vomiting shortly after meal times. Not only will a slow feed mode reduce bloat, it’ll also give your cat a chance to feel fuller by eating less. There are other modes out there, some even designed with multiple cat households in mind. Fancy features like this are usually only available on the high end models though, so be prepared to pay for them. If your cat has not been eating for a few days, you should visit a veterinarian immediately. Sarah Wooten DVM explains why. The responsibility of feeding a kitten can leave you anxious about your food choices. We're on hand to guide you through and recommend some of the best kitten foods available. Hairballs, eew! Let's look at some great cat food that are designed to prevent them. Don't waste your money on brands that don't deliver on their promises.